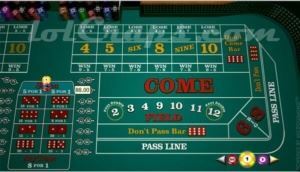 Online Craps is a very popular gambling game played with a pair of dice. It is most common in North America but has grown in popularity throughout the world, including Australia. Rolling 7 or 11 will put you on the path to big wins, while 2, 3 or 12 will result in defeat. 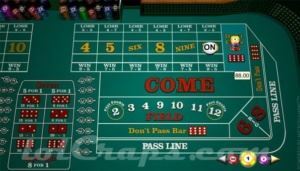 Craps is a dice game wherein players have to wager on the outcome of a roll, or a series of rolls, of a pair of dice, which makes is great fun for Australian players of all skill levels. 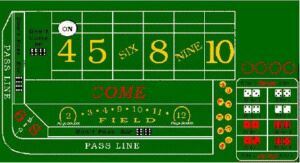 The game of Craps can trace its origins back to a game called ‘Hazard’, which was played by English soldiers during the Crusades. The game would be simplified over the years until it eventually started to spread around the world, gaining popularity everywhere it was played, including in Australia. 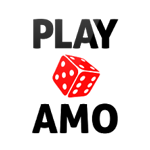 It has since become an iconic casino game the world over. 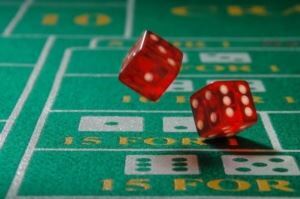 The history of craps seems to be fairly well documented and accepted. Historians have managed to trace its origins back to the Crusades in the 12th Century. At the time British soldiers were known to play a game with Dice called Hazard, although it was quite a bit more complicated than the game we know today. It was extremely popular in its day and eventually made its way to France. It didn’t take long for the game to make its way to the colonies in America, where the game began to be simplified. The name Craps is actually derived from the French word for Frog, because of the way people looked when playing it in the streets, crouched around the game. 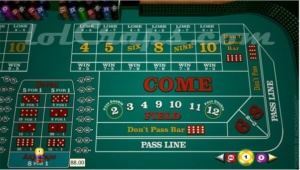 Craps as we know it came out in 1907, after being created by John H. Winn, who updated the game’s layout and made some other rule changes. 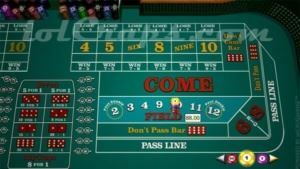 During the course of the 20th century, the game gained and lost popularity and it wasn’t until the 1990s when online casinos came around that it truly secured its spot as one of the most popular games around. 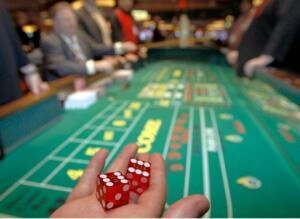 Read more about the history of Craps here. Pass Line Bet – this is the bet where a shooter can win. Don’t Pass Line Bet – this is a bet for the shooter to lose, is almost exactly the opposite of the Pass Line Bet. Pass Odds: this occurs when a 4, 5, 6, 8, 9, or 10 are thrown on the ‘come-out’ roll. Don’t Pass Odds: players can place chips on the don’t pass line. Come Bet: is an entirely new pass line bet. Don’t Come Bet: this is very similar to a don’t pass bet. 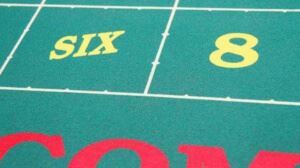 Box Numbers: If you look at the Craps table, you’ll notice the numbers 4, 5, 6, 8, 9 and 10 are marked in boxes. These are the box numbers. Don’t Come Bet: The player will win the wager if the shooter rolls a 2 or a 3, while a 7 or 11 will mean they lose. Field Bet: Betting that the shooter will roll a 2, 3, 4, 9, 10, 11 or 12. Free Odds: Placing a bet in addition to the pass line bet, one that has true odds and no house edge. 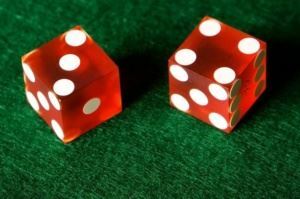 Hardways: Betting that the shooter will roll identical dice, totalling 4, 6, 8 or 10. Horn Bet: Betting the shooter will roll a 2, 3, 11 or 12. Lay bet: Wagering that a 7 will be rolled before a 4, 5, 6, 8, 9 or 10. Single-role bet: A bet that is determined on the outcome of the next roll. Want more Craps terms? We’ve got you covered here. Players are always looking for a strategy or some tips to help them win. In a game like Online Craps, which is purely based on luck, there is nothing you can really do it improve your odds. However, developing your own strategy does stand the chance of improving your experience when playing and giving you a better overall experience. 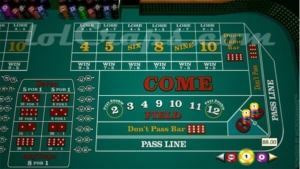 The fun in Online Craps comes from the complex betting structure, with some bets being decided after a single roll, while others can take several before a result is determined. As with most gambling games, the general rule of thumb is that the lower the payout it, the more likely that result is to happen. This is why most players try and mix their bets up and have some bets with good and bad odds. As with most games, we highly recommend that before you start playing, you decide on your budget. Don’t spend more money than that and don’t chase your losses. Also decide on how much time you’re willing to spend, because it is very easy to lose track of time and land up playing for hours. This is likely to get you in trouble with your friends or family, we’d advise against that. 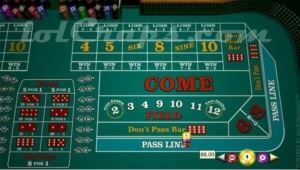 Click here to read our full guide on How to Play online Craps, or read more Craps tips here. 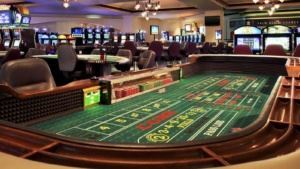 The greatest factor is the fact that players do not need to drive for hours to get to a casino and play the game – play from your Aussie home, be it in Perth or Canberra. No noise or other distraction, it’s purely just a player playing anywhere they want. 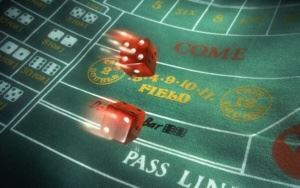 One thing players will learn about Craps is that it is a game of hot streaks. This is especially true when the player is the shooter, as hot streaks seem to be easier to come by than other games online. The great advantage is the betting factor. There are numerous ways in which players can place their bets and no one can or try and find fault in how much time you take. 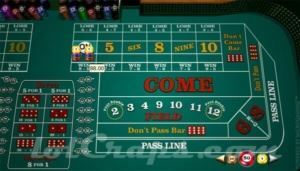 There are so many Craps variations that can be found, online that players will never have one dull moment. 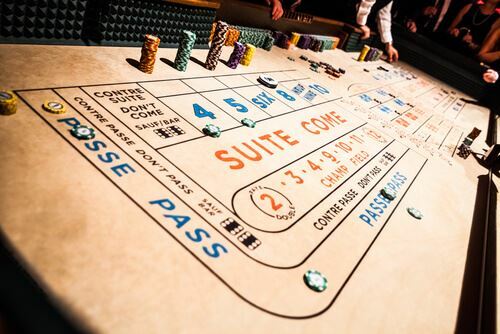 Whether they want to play a higher streak Craps game or just want to relax a little they can try it all. 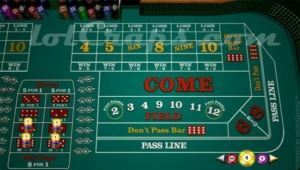 As most players will discover when playing Craps is that in the most preached things, is that players should be making odd bets with the prospective that the option is provided. If and when players are not familiar with odds bets then they can always just back pass the line bets along with them. This will definitely not be found in land-based casinos and thus this should immediately answer any doubts about online Craps. 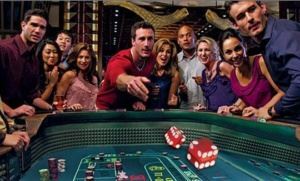 There are a lot of questions within the casino world, even more surrounding the realm of online Craps. Read on below to have a few of your questions answered surrounding this popular casino game. Must I throw the dice in Craps? This largely depends on whether you’re playing at a land-based casino or online. In an actual casino you’re under no obligation to throw the dice, you’re welcome to let someone else at the table do so. However, when playing Online, you will always have to be the shooter. However, this won’t be a problem anymore because you’re home along and you won’t have to worry about throwing the dice in front of a group of strangers who have bet money on the result of your throw. Overall a player’s chances of winning are pretty good, but this is a game of pure chance so it all comes down to luck. Regardless of whether you’re playing Online or at a Land-based casino, the house edge is only around 0.67%, due to the law of averages. This is not a very big house edge at all and a conservative craps player can normally expect to wins some fairly decent money. 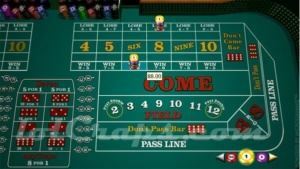 Can I try Online Craps for free before wagering real money? Thankfully yes you can. A few it was nearly impossible to find somewhere that allowed players to play for fee. Today, however, it is a very different story. 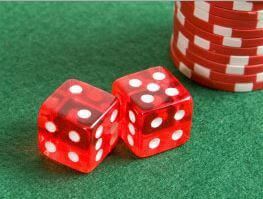 Almost every reputable Online Casino will allow players to enjoy a wide variety of games for free. This is especially helpful to new players who get a chance to learn the game and its rules before they start risking real money. 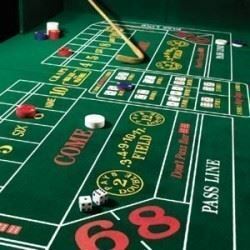 Craps is a funny name, why is it called that? To properly explain its name we need to go back to the Crusades, where English soldiers played a game that was similar, but far more complicated. This game was called Hazard and it was eventually passed on to the French, who took it with them to North America when they settled there. It was at this point that the game got simplified so that it could be easily played on the street. This is where its name comes from, as it uses a shortened version of the French word for Toad, which is Crapaud. It was called this because people looked like toads as they squatted around the dice while playing in the street. 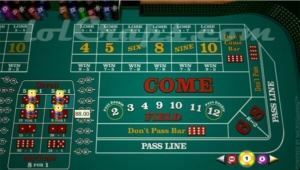 How can I be sure a game of Online Craps is fair? It is always important to make sure you’re playing at a reputable Online Casino that is regulated by a third-party. If you’ve found an Online Casino here, you can rest assured that we have check and made sure if has the appropriate accreditation and gets tested for fairness on a regular basis. Keep in mind though that whether you’re playing Craps Online or at a land-based casino, it is always a game of pure chance and there is nothing you can do to influence your odds.